On a rugged Colorado mountain ridge, Mattie Cobb and her police dog partner Robo make a grisly discovery-and become the targets of a ruthless killer. Colorado's Redstone Ridge is a place of extraordinary beauty, but this rugged mountain wilderness harbors a horrifying secret. 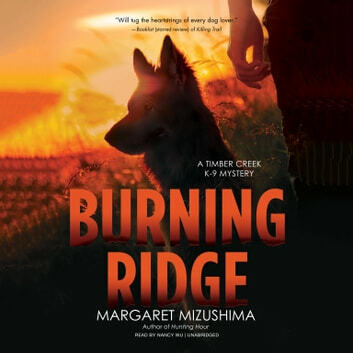 When a charred body is discovered in a shallow grave on the ridge, officer Mattie Cobb and her K-9 partner Robo are called in to spearhead the investigation. But this is no ordinary crime-and it soon becomes clear that Mattie has a close personal connection to the dead man. Joined by local veterinarian Cole Walker, the pair scours the mountaintop for evidence and makes another gruesome discovery: the skeletonized remains of two adults and a child. And then, the unthinkable happens. Could Mattie become the next victim in the murderer's deadly game? A deranged killer torments Mattie with a litany of dark secrets that call into question her very identity. As a towering blaze races across the ridge, Cole and Robo search desperately for her-but time is running out. A friend recommended this series to me, and when I saw this latest book available for review from Netgalley I decided to give it a try. A few pages in I decided to stop and go back to read the first 3 books in the series and I'm glad I did. I've enjoyed this series, and I've enjoyed watching the author hone her technique as it progresses. It's clear that she knows the animal side of the stories (both from a veterinarian aspect and a dog handling one). And over the series she's done a good job of revealing the whys and hows of her main character, small town police officer Mattie Cobb, and the reasons for the dysfunction in her personal life. This one has an interesting mystery and the investigation reveals more of Mattie's family background to both Mattie and the reader. The entire series has engaging characters and beautiful descriptions of the Colorado setting. And then there's the dog, K-9 Officer Robo. I do love a good story with a dog as a major character. I'm a fan, and look forward to the next installment in this series. As an aside, I did listen to the first 3 books and parts of this one, and can also recommend the audiobook versions for those who enjoy listening. My thanks to Netgalley and Crooked Lane Books for providing a copy for an unbiased review.